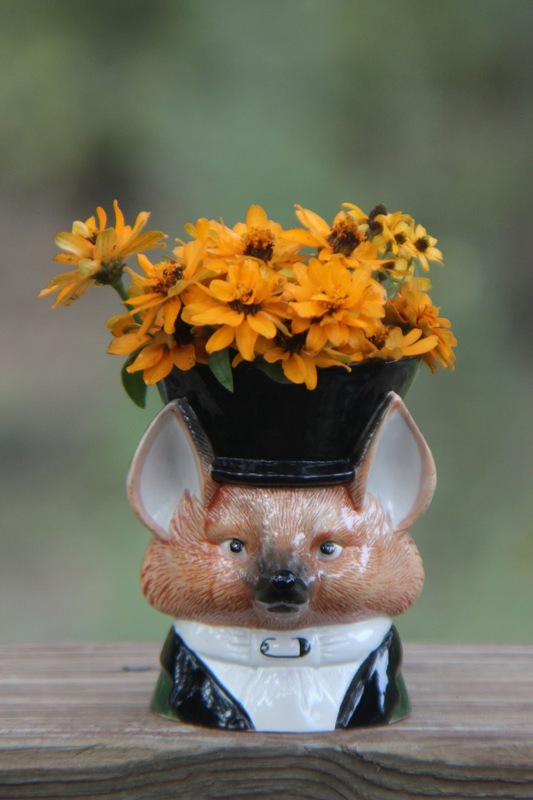 Autumn blooms have been going strong this year and I'm posting a collection of my favorites. Yesterday I highlighted the wheel garden of grasses and flowers in the back yard and today is a round-up of flowers from other gardens. 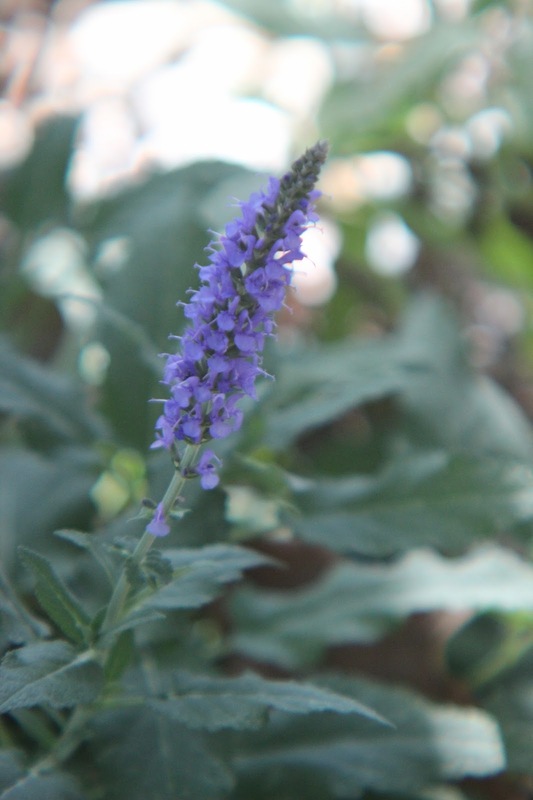 Looking across the back yard from the gate we see Salvia madrensis and violet ruellia. The wheel garden highlighted yesterday is in the background. 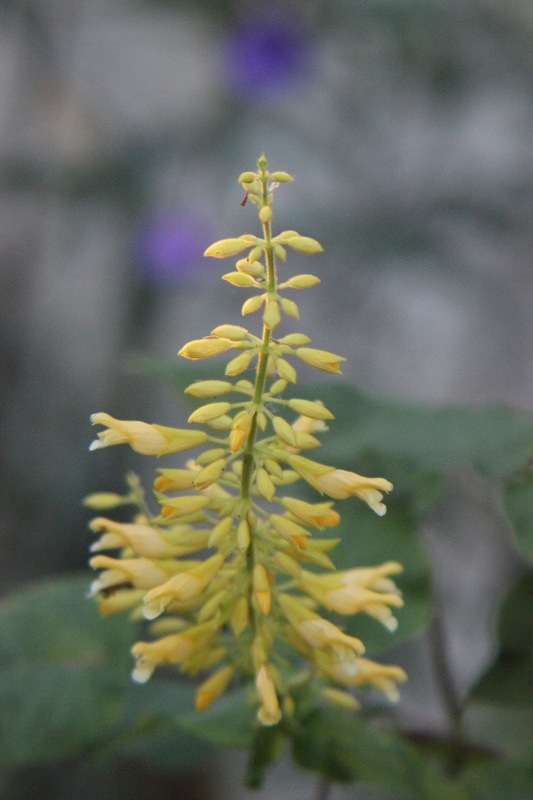 Salvia madrensis is a shade plant which produces bright yellow blooms in the fall. 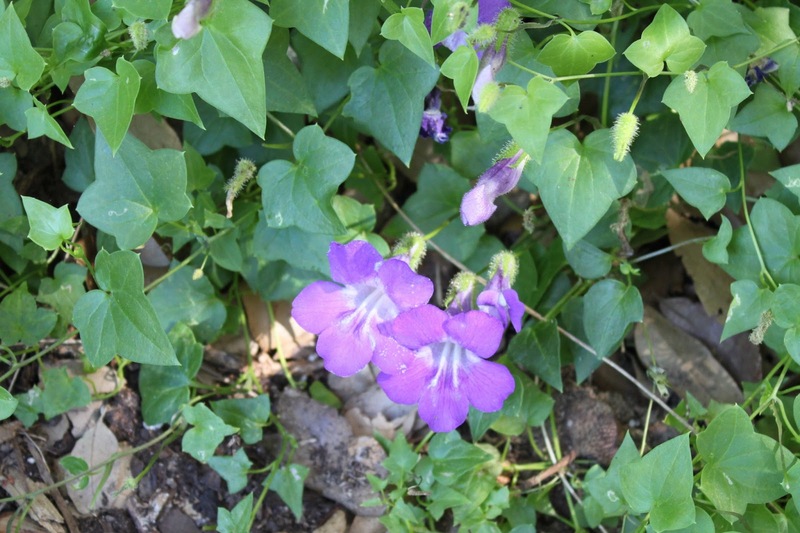 I pair it with the violet blooms of ruellia which were set back by our one cold night early in November. 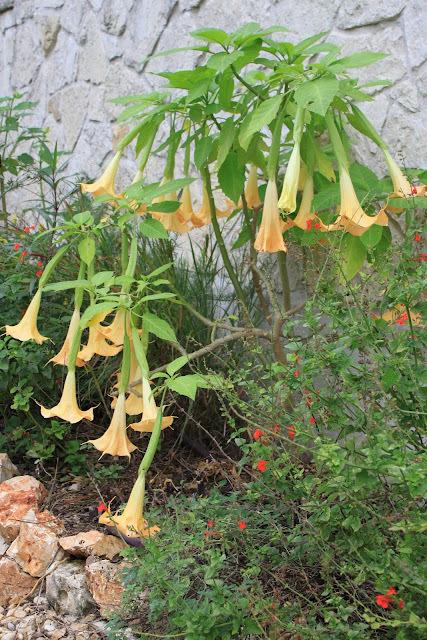 In the same bed along the house, Brugmansia 'Dr Seuss' had a flush of two dozen blooms at once. Across the way the flowers of our native Snapdragon vine show how they got their name. 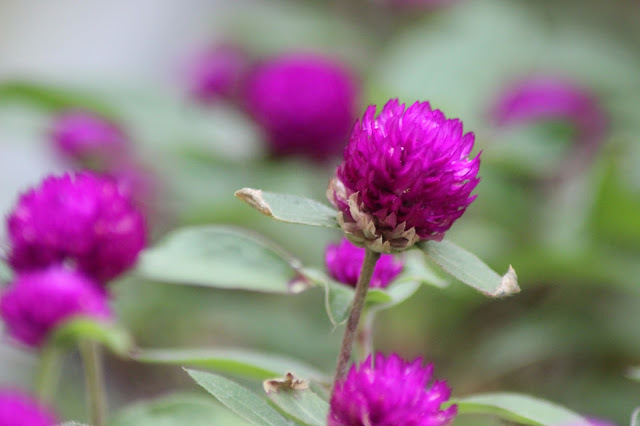 In yesterday's post I highlighted two types of Gomphrena in the wheel garden. There are more around the yard like these tiny native Gomphrena 'Little Grapes'. 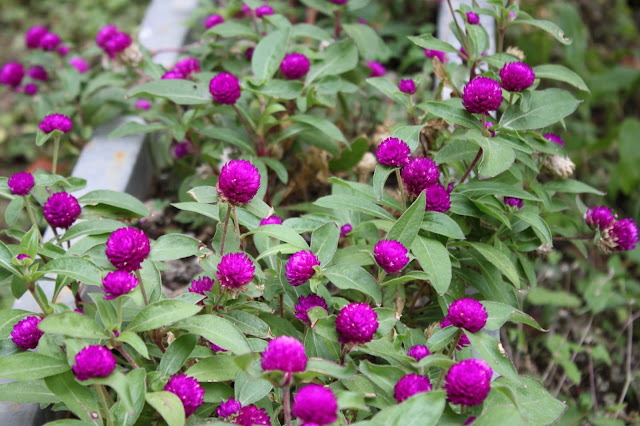 Purple Gomphrena in a galvanized planter along the fence is blooming beautifully today. 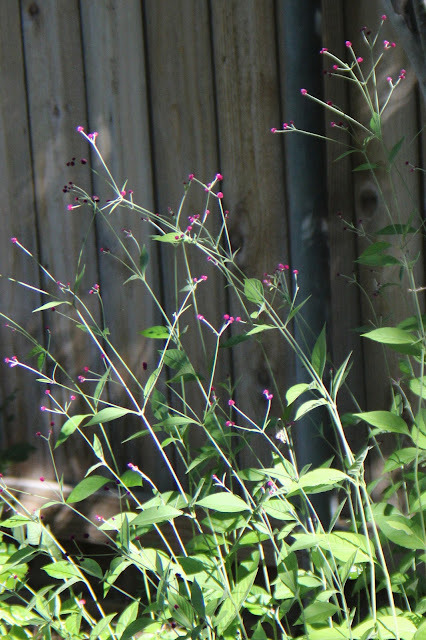 Over by the garage, the Bat-faced cuphea managed a few blooms before the deer ate them. They will be relocated behind the fence in the spring. 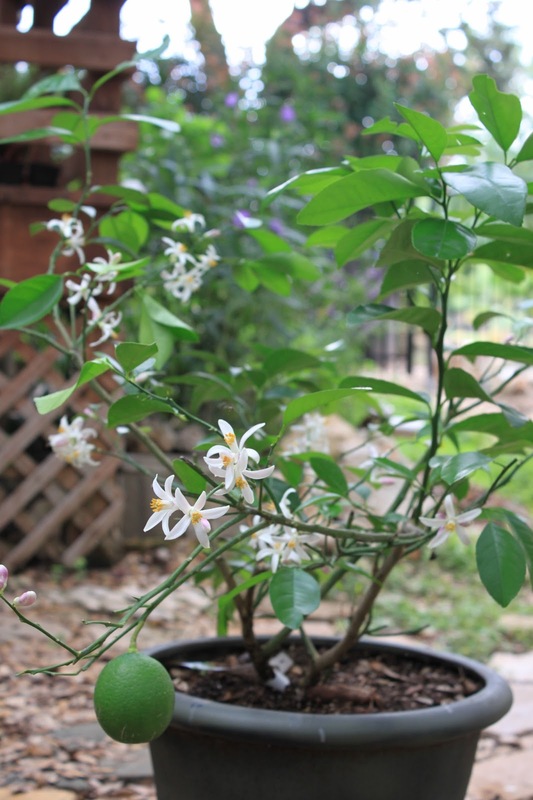 The Meyer Lemon bloomed even with a lemon ripening, these blooms all dropped off. Out in the front yard our native Gulf muhly bloomed for the first time. I've moved these three times in the last two years and have finally found a spot that works. Agave Ovatifolia isn't exactly a bloom but it's shaped like one so it counts. That concludes the tour of Autumn blooms in my garden. Thanks for reading this far! My garden always seems to look best in Autumn. After the heat-induced slumber of August the garden responds to the cooler weather by greening up and blooming like mad for three months. 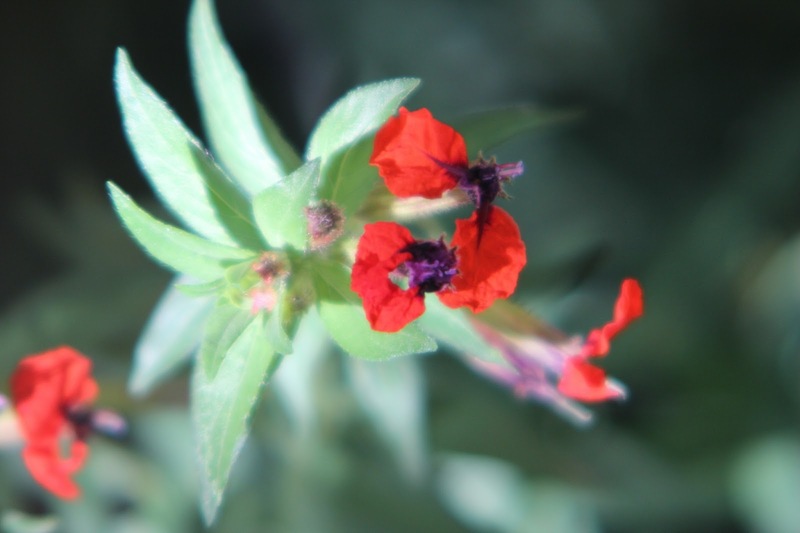 By the end of November blooms begin to fade and the plants prepare for winter dormancy. To celebrate a good year in the garden and because Garden Blogger's Bloom Day always eludes me, I'll post two days of blooms from the last few weeks. The best place to begin a round-up is with the wheel garden in the back yard of course. Just finishing its first full season, I am thrilled with how it has worked out and grown so beautifully from a rocky patch of dirt this time last year. Looking toward the shed from the house, Gregg's mistflower, pine muhly. 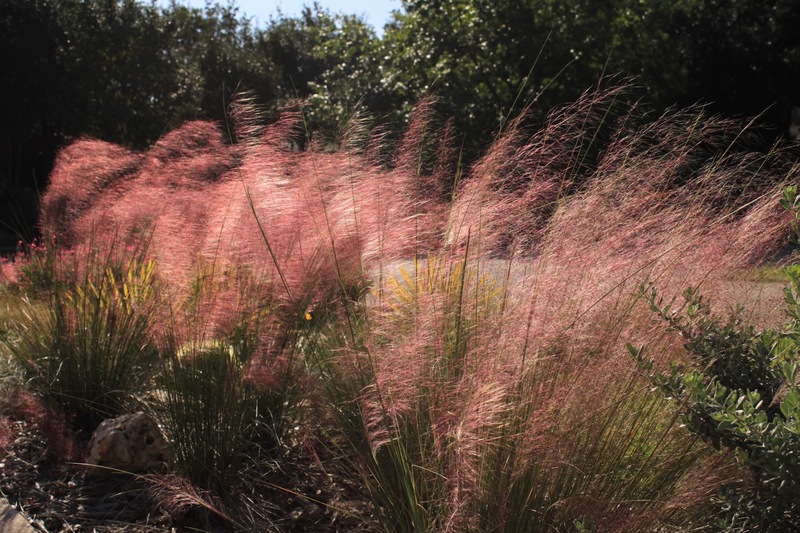 The large plumes catching the light in back are the "mystery muhly" which was incorrectly tagged as Lindheimer's muhly and has worked out well in the garden. The Texas sage near the street was one of the few plants remaining from the landscape installed by the builder and original owner of our house. Since the yard was quite a mess when we returned to San Antonio in 2008 we were happy to have a large plant that needed little or no attention right out front. Over time we have improved the landscape to the point where we now want to show off what was behind this sage, no longer needing to hide it from the neighbors. So the sage you see here in the front began to look a bit out of place. 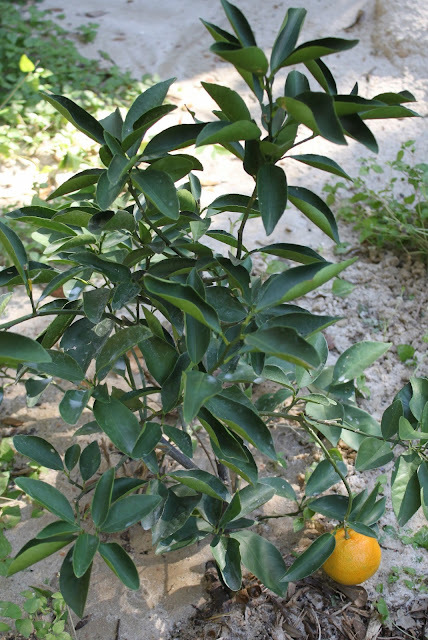 Back in the spring I headed out early one Saturday morning on a mission to be one of the first customers to buy a new variety of citrus tree named "Orange Frost" specifically developed for our South Texas climate. The advance word as recommended by our local Extension Service was that not only will the plant survive our wild weather range swings, but the fruit is seedless and sweet. So I put on my comfy shoes and headed out with my plant sale wagon. The tree I brought home had a number of small fruits and all but two eventually dropped off. The two remaining oranges grew and ripened until last week when I picked them a few days apart. It's been a good year for cactus blooms with milder than usual weather the last few weeks. 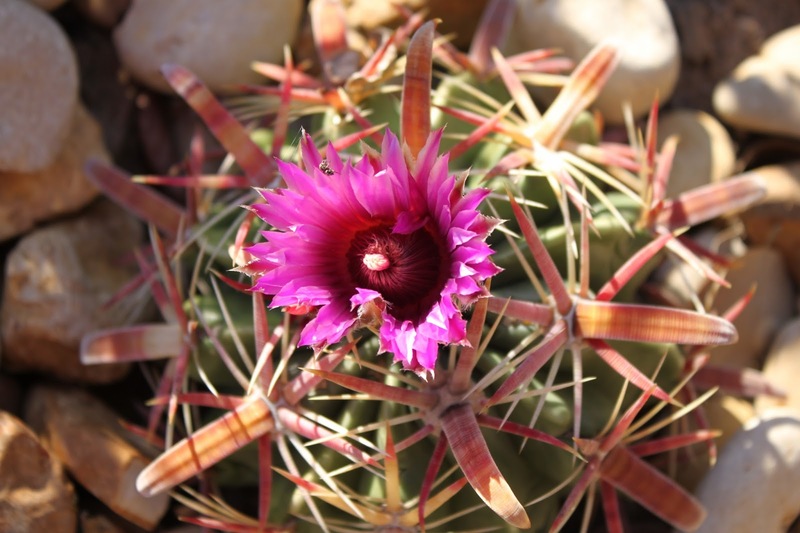 On Tuesday this Devil's Tongue barrel cactus (Ferocactus latispinus) bloomed for the first time. Bright purple and similar to a straw flower it waited through a string of cloudy days to burst into bloom when the sun appeared in the afternoon. Butterflies have flocked to the back yard, especially in my wheel garden where milkweed and other flowering plants have enticed them to a Thanksgiving week feast. We don't see a lot of Monarchs even though they are migrating through Texas to their winter home in Mexico, but a few found their way here this past weekend. The Gomphrena 'Fireworks' attracts plenty of butterflies like this Monarch. That's a Red Admiral flitting in the background. 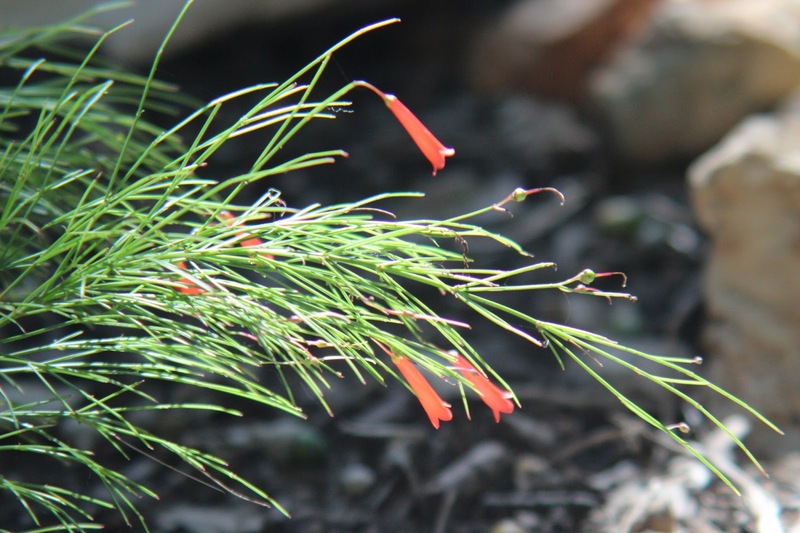 It's the 16th of November and time for Foliage Follow-up when bloggers highlight foliage in our gardens. My pick for this month is the bright Gold Mound Duranta (Duranta Erecta 'Gold Mound') in the front yard. The final garden on the Garden Conservancy Open Days Tour is the garden of Jeff Pavlat and Ray Clayton. A very special finale it was. Jeff is an avid collector of cactus and succulents and currently Vice President - Education for the Austin Cactus and Succulent Society where he has also served as president. The impressive garden terraces designed and built by Jeff and Ray are the first feature to greet visitors, and lead down the hillside from the street to the house. After leaving the Ten Eyck-Deaver garden and a quick stop for lunch we headed up Mt. Bonnell to see the next garden. The Mt. Bonnell Garden is a new professional installation designed by Curt Arnette of Sitio Design. The large corner lot presented challenges and opportunities which were met with a great design and plants well suited to our climate. 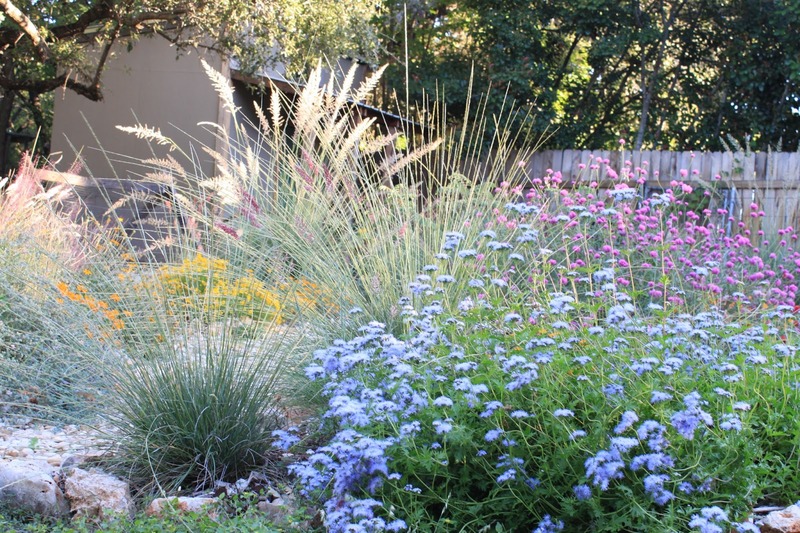 The Garden Conservancy's Open Days Tour in Austin showcased a diverse group of gardens. Today's featured garden is an example of that range. In fact, this stop on the tour wasn't as much about the gardens as it was about the house and the art in the garden. Of the six gardens on the tour this was the one I most wanted to see. I've been a huge fan of architects David Lake and Ted Flato's work since the moment I saw one of their homes on the cover of Metropolitan Home magazine more than 20 years ago. The architecture was clearly Post Modern, yet I knew at a glance, without reading the article, that this house was in Texas. Vernacular architecture at its best. Lake|Flato is based in San Antonio so I have seen several of their local commercial projects, but have never visited one of their residences. This house is listed on their site as the Lake Austin House. 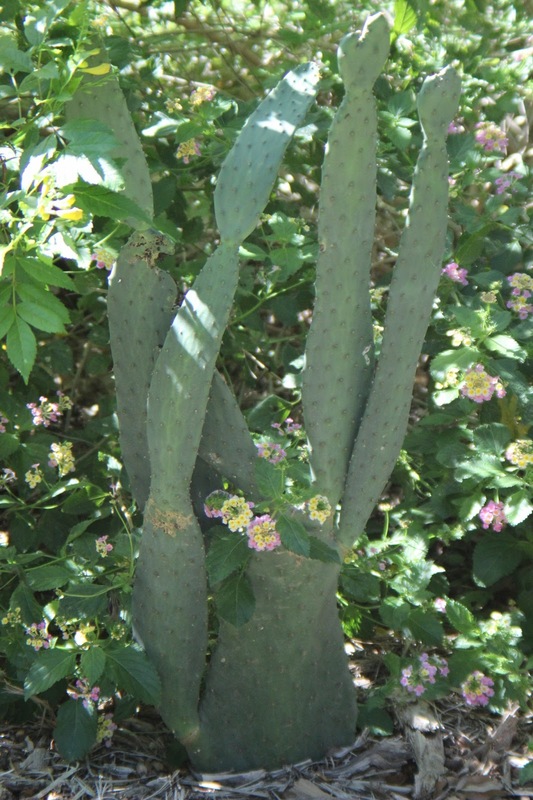 This stop on the tour, listed in the brochure as "Austin Private Garden" was more about the site and art on display than garden design and plants. We had access to a list which provided the names of the artists, but not the names of the pieces or the materials used. Through the front gate set into a limestone wall along the road, very little is visible from the road. 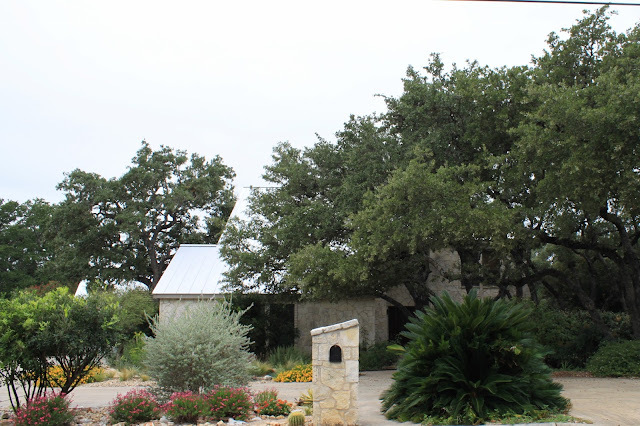 The Christine Ten Eyck and Gary Deaver Garden was the third garden visited on The Garden Conservancy's Open Days tour in Austin and a convenient short walk from the previous garden. 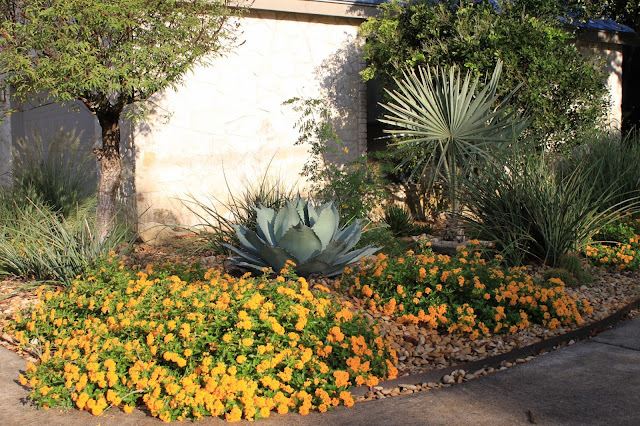 Christy Ten Eyck is an award-winning landscape architect with offices in Austin and Phoenix. 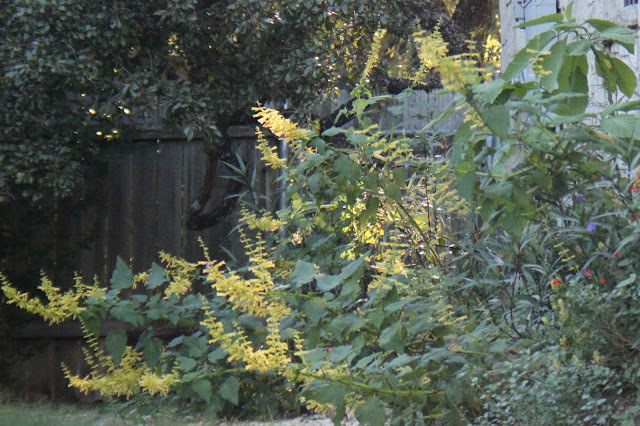 This was a much-anticipated opportunity to tour her personal garden in Austin. For more on the background of this garden check out Pam Penick's two posts on this same garden at her blog Digging. 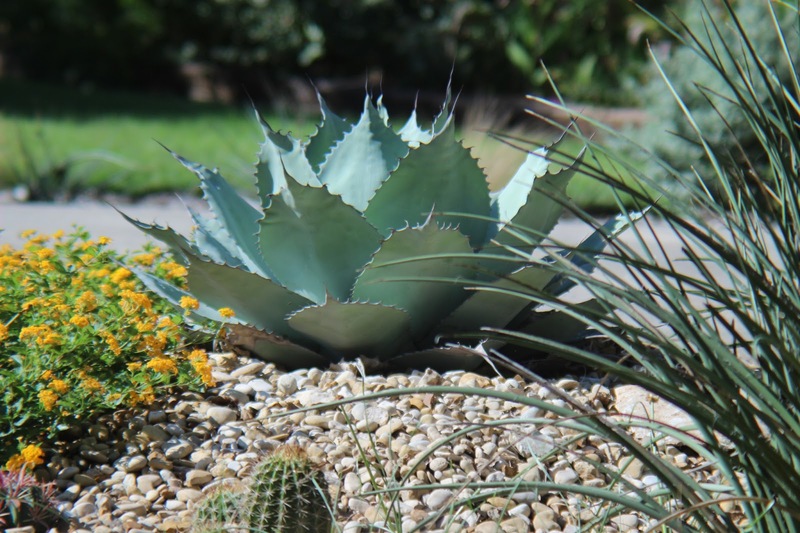 Large agaves with native flowers are living sculptures along the street. 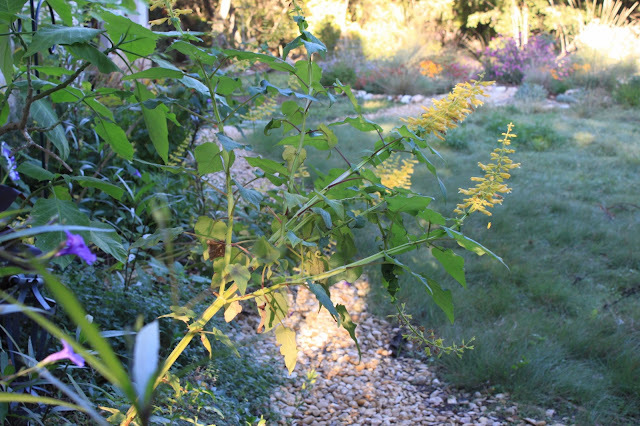 This past weekend I joined a group of garden bloggers in Austin for the Garden Conservancy's Open Days garden tour. Our group included Pam of Digging, Jean of Dig, Grow, Compost, Diana of Sharing Nature's Garden, and Catherine of The Whimsical Gardener. We had a great time touring six beautiful gardens around Austin. The second garden on our list was the Yvonne Tocquigny and Tom Fornoff garden. What a contrast to the first garden! This garden was designed for relaxation with extensive use of horizontal lines, pleasingly limited color palette, and repetition of plant selections throughout. The Garden Conservancy's Open Days tour is among the most anticipated since they try to feature the best gardens in the area. The tour comes to our region every other year and 2012 is the year for garden tours in Texas including Houston, Dallas, and Austin. Since there were no San Antonio gardens on tour and the Austin tour looked quite promising, I headed to Austin this past Saturday to join a group of garden bloggers, including Pam of Digging, who generously offered to drive. Our group included Jean of Dig, Grow, Compost, Diana of Sharing Nature's Garden, and Catherine of The Whimsical Gardener. I had so much fun meeting them for the first time and spending the day touring six special gardens in Austin. 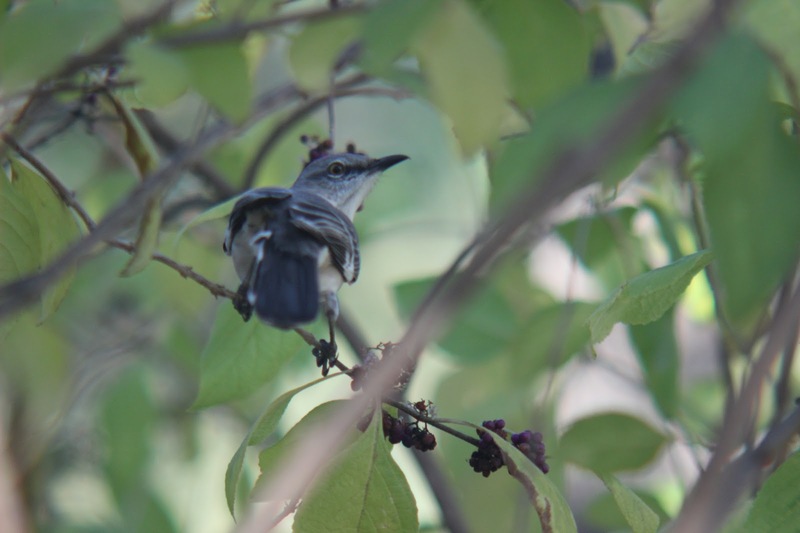 We began our tour in central Austin at the Jennifer and Fred Myers garden along the banks of Shoal Creek. This garden had me at the curb. Visitors and passers-by are greeted with this inviting view of the garden through these old wood church windows. Like most gardens, this one is a work in progress and the owners show it that way for the tour. I found this to be a refreshing approach. You can see bricks from the unfinished wall project through the windows here. While out for a walk I often imagine yard makeovers for the neighbors. I find it both entertaining and challenging. One of the more interesting homes I see on my walk has been sold recently which makes it fair game for musings about its future. 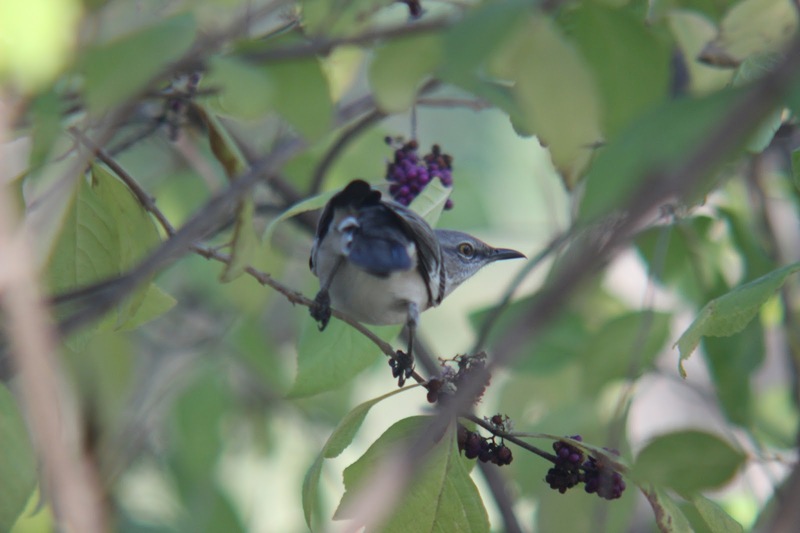 The Watersaver Landscape tour held in early October included the Olmos Park Terrace Community Garden which is part of the Green Space Alliance of South Texas.